Dr. Alessandro Curioni has been named vice president and director of the IBM Research lab in Zurich, Switzerland. The 22-year IBM veteran, who will assume the position at the end of the month, was named an IBM Fellow in 2014. He succeeds Dr. Matthias Kaiserswerth who will retire and as of 1 May become the new managing director of the Hasler Foundation, which promotes information and communications technology for the well-being and benefit of Switzerland. Dr. Curioni is a world recognized leader in the area of high performance computing and computational science where his innovative thinking and seminal contributions have helped solve some of the most complex scientific and technological problems in healthcare, aerospace, consumer goods and electronics. In 2013 he was a member of the winning team recognized with the prestigious Gordon Bell Prize. Dr. Curioni received his undergraduate degree in Theoretical Chemistry and his PhD from Scuola Normale Superiore, Pisa, Italy. He started at IBM Research – Zurich as a PhD student in 1993 before officially joining as a research staff member in 1998. His most recent position has been the head of the Cognitive Computing and Computational Sciences department. 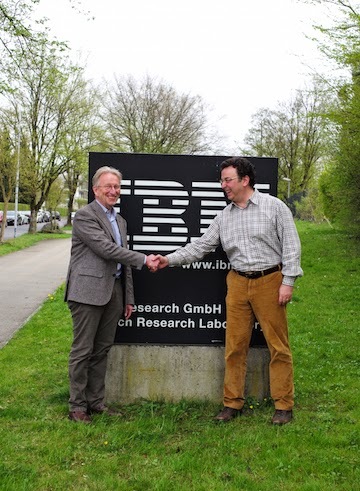 Dr. Kaiserswerth joined IBM in 1988 and was first named director of the Zurich lab in 2000. After taking a sales leadership role in Switzerland he was named vice president and lab director again in 2006. As director, Dr. Kaiserswerth has made an enduring mark both physically and intellectually on IBM Research – Zurich. He presided over a significant expansion of the campus including the opening of the client-focused Industry Solutions Lab and the cutting-edge Binnig and Rohrer Nanotechnology Center. On the research side, under his tenure the Lab has developed major advancements in banking security, smart grids, high performance computing, storage technologies, energy efficient data centers, and significant breakthroughs in nanotechnology. IBM has maintained a research laboratory in Switzerland since 1956. The facility is proud of its multicultural and interdisciplinary research community, which includes a combination of permanent research staff members, graduate students and post doctoral fellows representing more than 45 nationalities. IBM Research – Zurich is recognized around the world for its outstanding scientific achievements — most notably Nobel Prizes in Physics in 1986 and 1987 for the invention of the scanning tunneling microscope and the discovery of high-temperature superconductivity, respectively.